Here is a resource rich in drawings and photographs, with a tool to design custom garden sheds, pool sheds, cottages, cabins, garden studios, spa enclosures, workshops, outdoor storage sheds, tool sheds, or pool houses online. Order custom plans for your design or choose from our selection of stock plans. 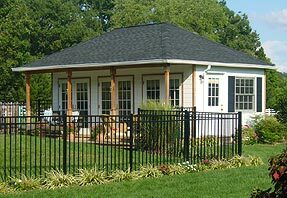 We have garden shed plans, pool cabana plans, pool house plans, five-sided plans corner shed plans, workshop plans, home office plans, and cabin plans. Should you require any assistance designing your plans, or for more information, send us an email at and we will be pleased to assist you. Design custom garden sheds, storage sheds, spa enclosures, pool cabanas, or pool houses online using our exclusive "drag and drop" design center. No software to download. Just use your browser and get a plan elevation and a custom price instantly! Watch our design center instructional video and you'll be designing your custom garden structure in less than 5 minutes!